How to Create Your Website Structural Design for SEO. SEO- you’ve heard of it and know it’s important, but what exactly is SEO and how do you use it productively? SEO stands for Search Engine Optimization. It’s the practice of getting traffic to your website or web pages from organic search results. Organic, in this case, doesn’t mean pesticide free, it means that when you search for a specific term or phrase, the results that pop up are the most relevant and helpful. This is why having an SEO savvy web design team is crucial! You want your website or web pages to be on the first page of Google, Yahoo, Bing, or any other search engine you use. When was the last time you went to the second page of Google results? A compelling website will have an exemplary structural design that will contain a streamlined system of planned content, organized hierarchy, and plenty of internal links. The most important thing is that all of this is done in a way that is easy for the user to navigate. Web design is complex, but the end result shouldn’t be. 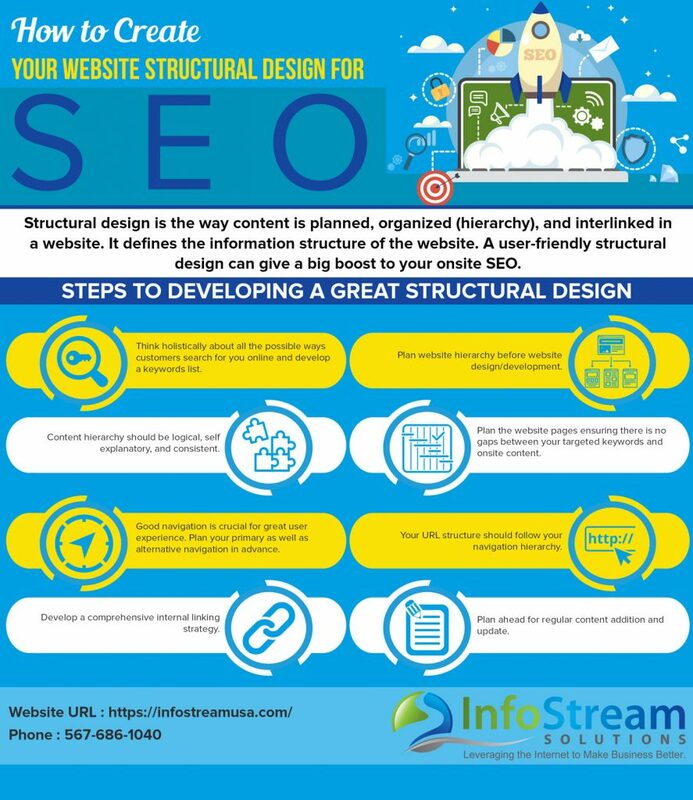 The InfoStream Solutions infographic highlights the importance of structural design for SEO. A website isn’t effective without keywords. When making a list of keywords, think about every possible term customers may search for you online. The search engines want to return results that are relevant to users, consider this, and what SEO keywords your users will use when planning your new website. Effective keywords will be ones that connect back to the core of your business. Planning website hierarchy needs to be done before any web design can begin. Hierarchy is necessary to show optimal website functions. Basically, hierarchy means content is organized from lower priority to higher priority. Important text should be at the top of a page while less important subjects should be put towards the bottom of a page. Content should be relevant, simple, self-explanatory, and consistent to ensure a positive user experience. Each page of content should have links that direct a user to more relevant content on your website. Internal links make website navigation easier while helps define the hierarchy of a website. The more content you create, the more linkable content you will have. The goal of internal links is to provide even more value to your web pages. This will support good SEO health, and a better user experience for your website visitors. Remember, content is the heart of web design. Plan ahead and add content regularly! Keep it simple, relevant, and valuable to not just your business, but most importantly, to customers. As seen in this infographic, the steps for a great structural design are a good guideline when developing a new website.